A few wearers were satisfied with the stretchable gaiter that prevented trail-debris from getting into the shoe. The majority of runners admired the impressive traction of the Salomon XA Enduro over technical terrains. Some runners liked the firm yet comfortable cushioning of the shoe. Most of the wearers noted the durable outsole of the XA Enduro. The upper mesh is breathable enough, especially in warm weather conditions, based on some reviews. A couple of users mentioned that the heel section of the upper unit held the foot securely while running downhill. Several runners were happy with the shoe’s wide toe-box. The automatic lacing system of the shoe gained positive impressions from a few consumers. According to few reviewers, the shoe is slightly expensive. After wearing the shoe several times, the protective gaiter started to stretch out and lose its structure, said a few testers. Generally, the Salomon XA Enduro gained positive feedback from a lot of trail enthusiasts. They were satisfied with the shoe’s durable construction, reliable grip, and protective features that are all necessary for a better trail running experience. Despite being expensive, some runners still found the XA Enduro a worthy investment. They're fantastic on the trails. At only 300 grams, you can just fly through those mountain trails. If you’re looking for a bombproof trail shoe, that offers tons of protection, stability, and sure footedness, the XA Enduro should be at the top of your shopping list. To really enjoy these shoes on less technical terrain you would have to like a traditional drop and firmer / more responsive ride. Fans of maximal cushioning should look elsewhere. A high end, great looking shoe with some fantastic features, the XA Enduro is destined to appeal to a wide range of trail enthusiasts committed to pushing their boundaries off road. The upper of the shoe features the protective gaiter that is integrated into the upper of the shoe. The gaiter is stretchable enough to hug the foot comfortably and it effectively prevents the trail debris from getting into the shoe while running. For a strong and stable heel, the Salomon XA Enduro utilizes an advanced chassis. It provides the heel a steady platform designed for efficient movement throughout the gait cycle. The shoe also features the Premium Wet Traction Contagrip® outsole. This rubber compound provides maximum grip while running on wet and muddy surfaces. It also gives durability in high-wear areas. 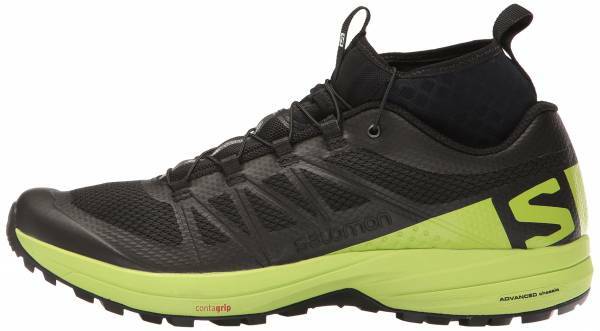 The Salomon XA Enduro is available in standard running shoe length. It is available in a standard width for both men and women’s version. The shoe has medium measurements in the heel, midfoot, and forefoot, providing those wearers with medium foot-shapes a comfortable and secure fit. The presence of the Premium Wet Traction Contagrip® technology in the outsole offers a durable grip even on wet and muddy surfaces. It also gives the sole unit the necessary protection against the damaging nature of the trail. The treads are distributed evenly in the outsole and they provide the necessary traction for downhill and uphill runs. The midsole of the shoe utilizes the dual-density EVA foam. It is designed to deliver durable cushioning for underfoot protection and stability. The foam remains light while it provides shock absorption and energy return for a more responsive ride. For additional underfoot cushioning, the shoe uses a molded EVA sockliner. It is also specifically inserted into the shoe for enhanced fit. The advanced chassis in the heel area provides the heel a more stable platform. It is necessary for stability, promoting an efficient foot movement throughout the gait cycle. Also present in the midsole is the Profeel Film material. It is a thin TPU film that provides midfoot protection and support while keeping the ground feel unaffected. It provides foot support during the heel-to-toe transition and enhances the overall performance of the shoe during toe-off. The upper of the Salomon XA Enduro utilizes an open mesh material that provides breathable coverage for a well-ventilated running experience. This fabric also has a quick-drying feature, which is necessary in keeping the foot dry all throughout the run. One of the notable aspects of the XA Enduro is the protective stretch gaiter. The gaiter is integrated into the upper of the shoe. It is designed to prevent trail debris from getting into the shoe while running. Just like in the popular Salomon Speedcross 5, the shoe also features the Salomon’s Quicklace™ system with friction-free eyelets. It facilitates one-pull tightening and quick loosening of the laces for an easy-on and easy-off of the foot.